Preparing for Success: More than a degree, it's HR Experience! 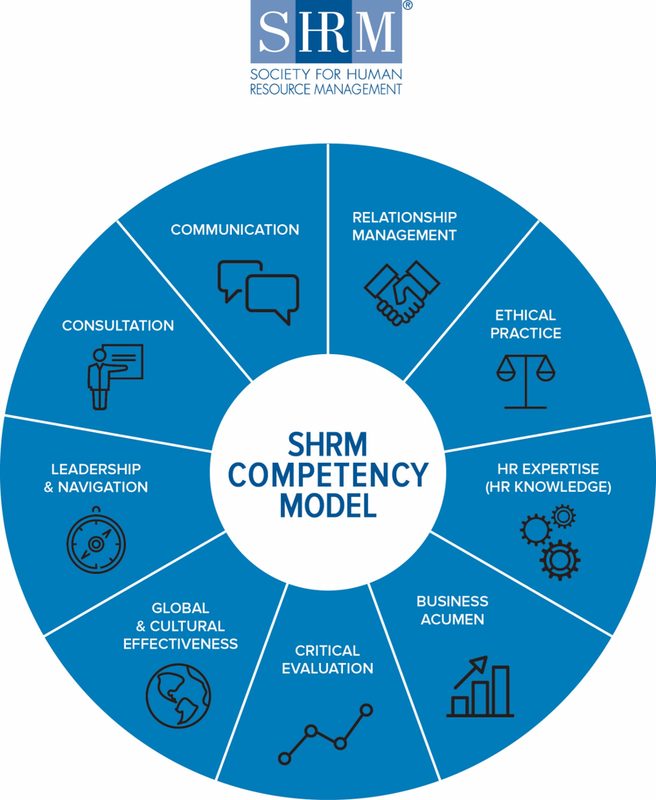 The purpose of the SHRM Competency Model is to identify the skills necessary to be a successful Human Resources professional. Communication: The ability to effectively exchange information with stakeholders through written and verbal communication, feedback, facilitation, active listening, persuasion, and diplomacy. Relationship Management: The ability to manage interactions and provide service and support to the organization through credibility, customer relation, business networking, teamwork, customer service , and mutual respect. Ethical Practice: The ability to integrate values and accountability in the organization through integrity, rapport building, courage, professionalism, and building trust. HR Expertise (HR Knowledge): The knowledge of principles, practices, and functions of effective human resource management through risk and strategic business management,workplace planning, Human Resources development, and Human Resource technology. Business Acumen: The ability to apply information to the organizations strategic plan through strategic agility, business operations and logistics, sales and marketing, systems or process thinking, organizational metrics, and economic awareness. Critical Evaluation: The ability to interrupt information to make business decisions and recommendations through critical thinking, measurement and assessment, knowledge management, research methodology, and inquisitiveness. Leadership & Navigation: The ability to direct and contribute to initiatives and processes in the organization through change management, being goal orientated and mission driven while having influence and consensus. Consultation: The ability to guidance to stakeholders through people and project management, problem solving, coaching, and analytical reasoning.